About half of the IBLCE exam questions are based on images. These images often trip up exam candidates. How can you answer those questions correctly? Want immediate feedback on your ability to answer questions? 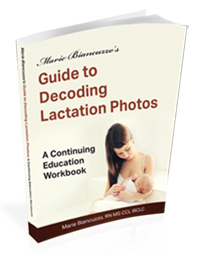 Get Marie Biancuzzo’s Guide to Decoding Lactation Photos. You’ll find terminology exercises, matching exercises, word-find, and test questions and more interactive exercises in every chapter. Learn to distinguish between similar but different conditions; recall and apply knowledge of typical features; solve clinical problems and more. Designed to be used with The Breastfeeding Atlas (6th Ed) it’s perfect as you prepare for a lactation exam or improve your physical assessment skills. If you’ve been tripping over words like craniosynostosis, hypoplasia, nevus, hemangioma, induration or peau d’orange, you’ll find these and other conditions are clearly illustrated in The Breastfeeding Atlas (6th Ed), and by completing the interactive learning exercises in the Workbook, you’ll strengthen your ability to recognize these conditions. Need CERPs or credits for your nursing license? Enroll in Marie’s course that uses this workbook. determine how to problem-solve issues related to technological devices associated with breastfeeding and human milk. relate physical indicators of growth and development to feeding management strategies. Even if you’ve taken one of Marie’s courses in the past—highly acclaimed for Marie’s interactive teaching style—you’ll find even more active learning methods that help you to see clues in photos that typify common and not-so-common conditions in breastfeeding mothers and infants. Click here to get your workbook today! You must have the 6th Edition of The Breastfeeding Atlas to use this workbook. If you do not already have the Atlas, Click here. Save even more money with our Money-Saving Exam Study Packages!